In Syria's cities and towns, entire blocks of apartment buildings have been shattered, their top floors reduced to pancaked slabs of concrete. Centuries-old markets have been gutted by flames and gunfire in places like Aleppo and Homs — an irreplaceable chunk of history wiped out in a few hours of battle. And then there are the many factories, oil pipelines, schools, hospitals, mosques and churches that have been systematically destroyed in nearly 19 months of violence. Aside from the human tragedy of the many lives lost in Syria's civil war — activists estimate the death toll has now passed 32,000 killed — there is the staggering damage to the country's infrastructure, economy and cultural treasures. Syrian Prime Minister Wael al-Halqi said last week that the economic losses from the ongoing conflict have cost the country about $34 billion, with the figure rising daily, while the opposition estimates the loss at about $100 billion. Experts say the real figure cannot be measured with any accuracy, given the continuing nature of the raging violence and the difficulties involved with getting independent observers into the country to assess the damage. Although there are some pockets of Syria that have been relatively shielded from the conflict, the destruction in most of the country's major cities is staggering. Experts warn that whenever the civil war ends, it will take a monumental international effort, and perhaps a generation of Syrians, to rebuild what has been broken. "In terms of infrastructure, major parts of Syria have effectively been bombed back to Ottoman times," said Ammar Abdul-Hamid, a Syrian activist and a Washington-based fellow at the Foundation for Defense of Democracies. The London-based Syrian Network for Human Rights, which compiles statistics from the conflict, said in a Sept. 28 report that 589,000 buildings — including residential homes, schools, mosques, churches and hospitals — have been destroyed, with thousands more severely damaged. The group said it used specialized civil engineers to come up with its damage estimate and put the cost of reconstructing residential properties and other buildings at about $40 billion. Before the March 2011 start of the uprising against President Bashar Assad, Syria had prided itself on being an oasis of security in a region wracked by violence and sectarian tensions. Despite the regime's massive corruption and a repressive political dictatorship, there also were signs of progress: The country had finally shed its socialist legacy, the economy was booming, and its cafes were packed with tourists, young entrepreneurs and businessmen discussing their latest projects. That image could not be more different now. Aleppo, Syria's largest city and its commercial and cultural center, has been hit hardest by the violence, along with the central industrial city of Homs. In both places, large swaths of residential areas have been razed, buildings have gaping holes and scorched facades, and hundreds of factories and manufacturing plants have closed. When the uprising began, inspired by Arab Spring revolts that brought down longtime dictators in Tunisia, Egypt and Libya, Syrian forces used light weapons to disperse largely peaceful protesters. 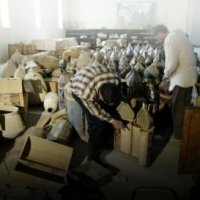 As armed elements began to fight back, the Assad regime began using heavy machine guns, artillery and tanks against them. The conflict soon became a full-blown armed insurgency and the Assad regime grew more desperate, introducing military aircraft. In recent months, warplanes have been used daily, pulverizing buildings in an attempt to crush rebel strongholds. On Sept. 29, a fire caused by the fighting swept through Aleppo's covered market, a UNESCO World Heritage site in the Old City, burning more than 500 shops in the narrow, vaulted passageways. Some of the country's most significant historical sites have been turned into bases for soldiers and rebels, including historic citadels and Turkish bath houses known as hamams. "It's a dirty war. Nobody is stopping for a minute to consider the damage that they are causing," said Haytham Manna, a prominent exiled Syrian opposition figure, likening the fighters on both sides to Taliban extremists who in 2001 smashed the 1,500-year-old Buddha statues in Bamiyan, Afghanistan. "Who will pay these bills later on? Nobody," he said. The civil war also has brought economic suffering — both from the destruction and from crippling sanctions imposed by the West against Assad's crackdown. Vital sources of revenue, such as tourism, have dried up, and much of the economic squeeze has hit low-level merchants and businesses. The country's currency has weakened — it now takes 68 Syrian pounds to buy a U.S. dollar, instead of 47 at the start of the conflict. The Syrian central bank says inflation reached 36 percent in June. The price of basic foodstuffs and fuel has increased by much more, straining household budgets and leaving many parts of the country facing severe shortages. U.S. and European Union bans on oil imports, which went into effect this year, are estimated to be costing Syria about $400 million a month. Before the uprising, the oil sector was a pillar of Syria's economy, with exports — mostly to Europe — bringing in $7 million to $8 million per day. This income was a key to maintaining the $17 billion in foreign currency reserves that the government had accumulated from a brief oil boom in the 1990s and maintained until last year. The government has not said what currency reserves it has left, but the London-based Economic Intelligence Unit estimates it to be a little more than $4.5 billion. Robert Powell, Middle East analyst for the EIU, said the economy alone probably won't bring down the Assad government in the near future. "It may be another year or so before the economy falls off the precipice," he said. Experts say the loss of Syria's currency reserves is the single most worrying aspect for the country's recovery prospects. "That's like mortgaging Syria's future," said Jihad Yazigi, editor in chief of The Syria Report, an online economic and business digest. "By burning through the foreign reserves that took really a decade to accumulate, you are putting future Syrian governments, and future generations, without any reserves." Added Yazigi: "When the war ends, where will the government get the money to finance the reconstruction? They will have to borrow huge amounts and in the end, the people who are going to repay the debt are the Syrian people." Abdelbaset Sieda, head of the Syrian National Council opposition group, told a meeting of Syrian opposition representatives and diplomats in Berlin last month that the country would need a program similar to the post-World War II European reconstruction effort known as the Marshall Plan. The gathering, chaired by Germany and the United Arab Emirates, was designed to address how to prevent the collapse of basic services and infrastructure, and how to revive the economy in the post-Assad era. Unlike neighboring Iraq, Syria lacks vast oil reserves that could help finance the reconstruction. Assad's regime has devastated the public finances and institutions to such an extent that Syria won't be able to rely immediately on oil revenues and taxes to rebuild, Sieda said. German Foreign Minister Guido Westerwelle urged the international community to be ready to provide economic support, and another meeting is set for next month to bring together Syrian businessmen and foreign donors. Manna said the opposition's $100 billion damage estimate — which is double the size of Syria's GDP at the end of 2010 — includes the physical destruction as well as losses from tourism and oil sectors, the sharp fall in productivity and soaring unemployment from job losses. Syria has only to look to neighboring Lebanon for lessons on reconstruction. Following that country's 1975-90 civil war, the government borrowed heavily from abroad. It accumulated a debt of about $52 billion, or about 130 percent of the country's GDP, that Lebanon struggles with to this day. Osama Kadi, general coordinator for the Syrian Economic Task Force, is confident that won't happen with Syria, which has a more diversified economy than Lebanon. He said the group has been lobbying the international community to organize a donor conference to convene less than a week after the collapse of the Assad regime. "Our estimate is that in the first six months, around $40 billion will need to be spent on reconstruction to allow for refugees and internally displaced people to return to their homes," he said. He said that with Syrian businessmen and Gulf countries willing to invest in Syria, a future government would not have to borrow heavily. Deep divisions among Syria's opposition and rebel groups are likely to complicate any international efforts to help in reconstruction. Syrians also are convinced they will get little outside help to rebuild, just as they have had to fight Assad's regime without a lot of foreign assistance. "We have a long way ahead before we put the country back together again," Abdul-Hamid said. "But once we do, and we will, it will be our achievement."